Every single moment of our lives matter. The words we say, the smiles we share, the tears we cry, the gifts we give: Each breath we take matters to God, and He uses it ALL for His glory, even if it seems insignificant to us. On a rare occasion we are blessed to catch a glimpse of how God weaves every detail of our lives into His master plan. This weekend, we were excited to have new friends over for dinner. The kids had a great time playing together, even dressing up and putting on a few plays for us! In the midst the hubbub, one of the girls came up to us adults with a picture frame and asked what it was about. Jackson was excited to share about when he was baptized, and the girl asked right then when she could be baptized. Her mom and I began a conversation about what it means to have a relationship with Jesus. Even Jackson was able to talk about accepting Jesus as your Lord and Savior. Everyone had questions, and God was at work, drawing us all to His heart. We decided to continue our conversation the next day at church, and by the end of the morning, we were praising God for two new sisters in Christ!! I texted my sister-in-law that night to tell her that she was a part of two people beginning a new life with Jesus. Two years ago, she and her husband chose to leave their home very early in the morning to make it down to see their nephew be baptized. They gave him a special frame to put a picture of the day so he could always remember when He obeyed God and showed the world his commitment to Christ. We never did get that photo developed, but Jackson has kept the frame proudly on his dresser. 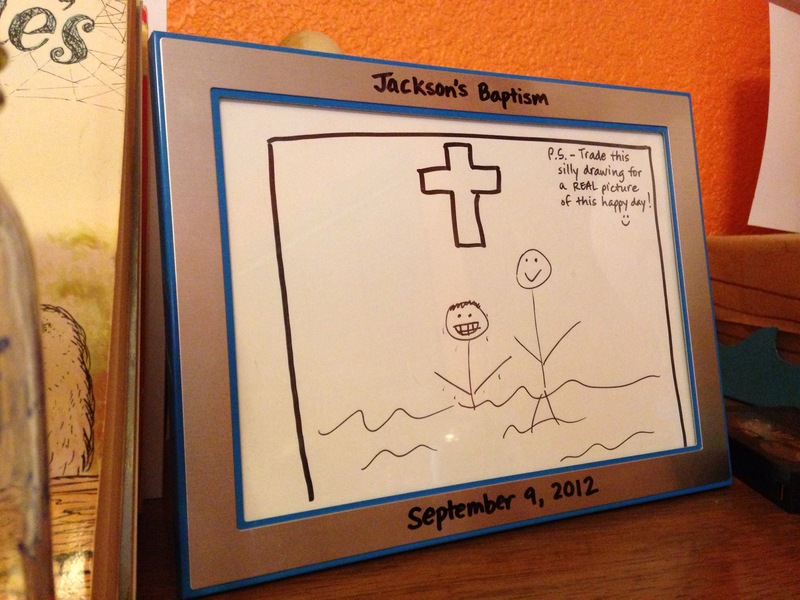 And this weekend, God used that hand-drawn doodle in a frame to prompt questions that led two hearts to Jesus’ side. Every thought, every word, every action matters. ← Do you believe this?